Target: Purell Hand Sanitizers as low as $.19 each! Target: Tums Chewy Bites only $.89 each and Duncan Hines Brownie Mix only $1.00! Target: Wet Ones Wipes Canisters only $1.14 (TODAY ONLY) and Tic Tacs only $.42 each! Target: MONEYMAKER Yummy Spoonfuls, $.39 Vaseline Lotion and $1.26 Tena Pads! Target: Earth Balance Buttery Spread only $.92 each and Wholesome Frosting only $1.59 each! Target: Sargento Snack Bites only $.49 each after Coupon and Cash Back Offers! Target: Newman’s Own Dressing only $.63 each and Great Deal on Metamucil Fiber Wafers! Target: Awesome Deals on Bio-Oil SkinCare (ends TODAY) and Gerber Graduates Snack Container! 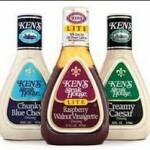 Target: Ken’s Salad Dressing only $.33 each after Coupon and Cashback Offers! Target: Rotel Tomatoes only $.64, Nakano Rice Vinegar only $1.49 and Olive Garden Dressing only $1.84 each!